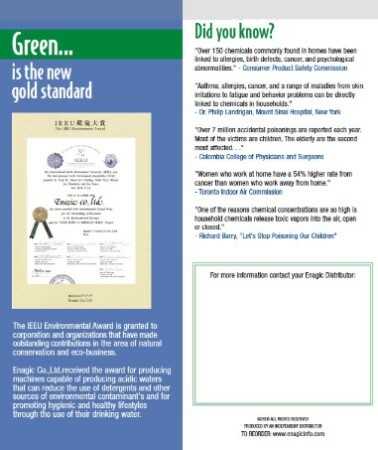 SPANISH This informative brochure tells the story about using Eco-Friendly Kangen water to clean and disinfect. 2.5pH strong acidic water has been proven to kill a wide range of bacteria and is used in hospitals in Japan to sterilize operating rooms and surgical equipment. 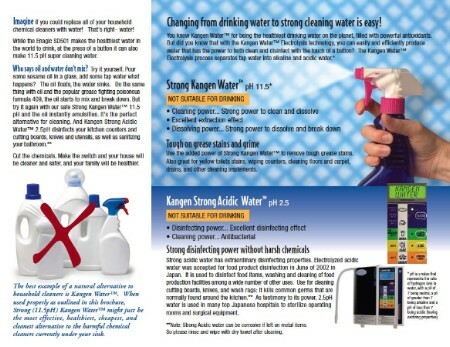 The 11.5pH Strong Kangen Water dissolves grease and grime better than the strong household chemicals you're storing under your sink.